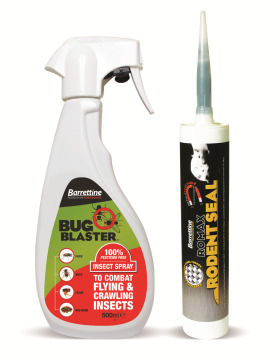 Romax Rodent Seal from Barrettine uses a high-quality industrial sealant in a patented mix of stainless steel fibres. The benefits of such ‘wire wool’, plus proofing materials, has long been known but, for the first time, they’ve been combined to offer a professional and time-saving solution to exclusion, says the company. In addition, the product has been commercially tested and is ‘metal-detectable’, making it a good choice for sealing around plant and machinery in the food industry, whether this is for rodents, insects or just housekeeping. Meanwhile, the effective insecticide-free spray Bug Blaster promises rapid knockdown. As the formulation contains no insecticide, the product will not have any residual action, says Barrettine.